One of the more interesting claims that Lance Armstrong made during the first part of his interview with Oprah was that he was clean during his comeback. He openly admitted that he was using performance enhancing drugs during his seven titles, but said that he was hurt by the accusations that he was using them again during his two year return to the sport. However, there are plenty of doubters, many of which point to his blood passport to argue that there is significant evidence of doping, even during this period. The data is available on the Livestrong website (available here) for the public to scrutinise. The three important columns are those titled hemoglobin, hemocrit and reticulocytes. A few basic definitions to begin with. Hemoglobin is a protein found in red blood cells that carries oxygen. Therefore, the higher the level of hemoglobin in the blood, the more oxygen-carrying potential that your body has. Hematocrit is a measure of the percentage of the blood that is made up of the oxygen-carrying red blood cells. Again, the higher the hematocrit rating, the more red blood cells that are contained in your blood, and the greater the oxygen that can be transported in the blood. Finally, reticulocytes are immature red blood cells, that general mature into mature red blood cells within two days. 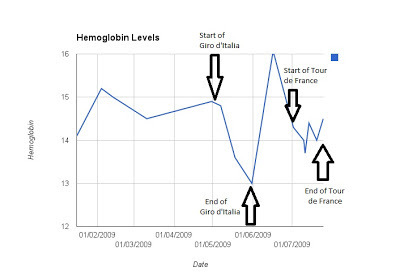 As a further piece of background, an academic study, conducted by the Danish academic, Jakob Mørkeberg, looked at the hemoglobin and hematocrit levels of a number of cyclists during the 2007 Tour de France. 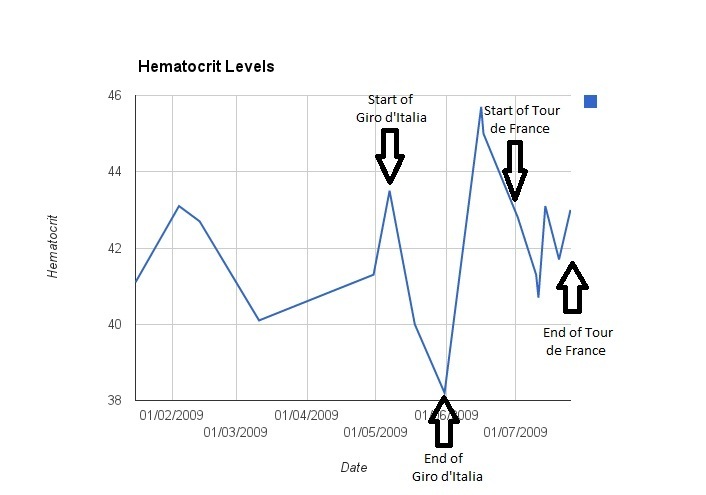 This study revealed lower hemoglobin and hematocrit levels on the final day of the tour, when compared with those on the first day of the tour. In fact, hemoglobin dropped by an average of 11.5% and hematocrit dropped by an average of 12.1%. During 2009, Lance Armstrong rode both the Giro d’Italia and the Tour de France - two of the most challenging stage races in the sport. The first race was the Giro d’Italia, which began on the 9th May and ran through until the 31st May. As we can see, at the start of the race, the hemoglobin measure was at 14.8. As the race progressed, we see it drop off, reaching a trough on the final day of the Giro at 13.0. In percentage terms, it fell by 12.2% - slightly above the average found by the Mørkeberg study - but around the level that we would expect. The Tour de France began on the 4th July, running through until the 26th July. At the start of the race, the hemoglobin was recorded at 14.3. However, unlike the Giro d’Italia, we see the level drop, but then unexpectedly rise, not once but twice. In fact, the level of hemoglobin at the end of the race was actually recorded at 14.5 - higher than it had been at the start. Indeed, the two sharp upturns that we see in the data were from tests carried out on the 14th and the 25th. Interestingly, they were the first tests carried out after the two rest days during the race. In accounts, his former teammates have described how blood transfusions and doping practices would take place on the days off during these races in the past. Again, we can see the sharp fall that we would expect during the period of the Giro d’Italia. The percentage fell from 43.5 to 38.2 over the course of the race - a 12.2% fall. This is almost spot on the average of what we expect to see from a clean athlete. 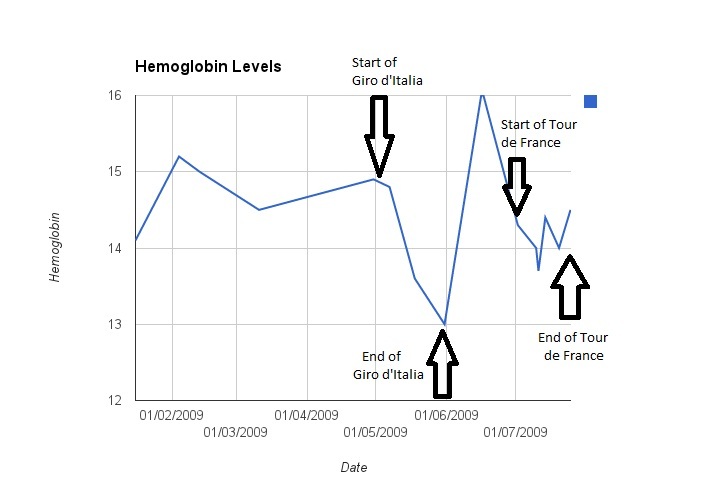 However, if we look at the data during the Tour de France, we again see these dramatic spikes following rest days that would be coherent with some form of doping or blood transfusion. Finally, the level of reticulocytes during the period of the Tour de France are significantly below the average of the rest of the year. This would also be consistent with blood doping, where blood would be being reinserted into the body, reducing the need for new immature red blood cells to be produced. The chances of these measurement occurring naturally is believed to be around one in a million. Given his history of doping, it would seem that there are certainly questions to be answered. Is this conclusive proof that Lance Armstrong lied in the interview and was doping during his comeback? No. However, particularly given his past, it does throw doubt onto the claims that he is making in this interview. Interesting graphs. That massive spike before the Tour - is that a result from recovery after the Giro? How does the slope of that increase compare to those after the Tour rest days?